I Thought It Was A Car At First. Now Watch What Happens When He Opens A Door… WOW! Home » Videos » I Thought It Was A Car At First. Now Watch What Happens When He Opens A Door… WOW! Mikael Kjellman, a Swedish design engineer, wanted a weather-protected bike. He wanted it to be more comfortable than normal bicycles. So he went on to design what he calls the PodRide, aka “a fun and practical bicycle-car”. 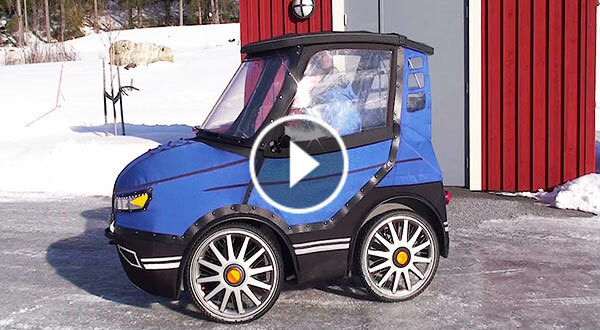 When you see the prototype of this bicycle-car below, you are going to be really impressed. The PodRide is a combination of a small car and a bicycle and it only weighs 154 pounds. But it is still the same height as a normal car. There is even storage space, and drivers can hook a bike trailer to the back as well. It is narrow enough to fit on regular bike paths, and is classified as an e-bike in Sweden. So it does not require any special licenses or insurance either. I wouldn’t mind going around in this awesome PodRide. Please SHARE this incredible idea with your friends on Facebook!